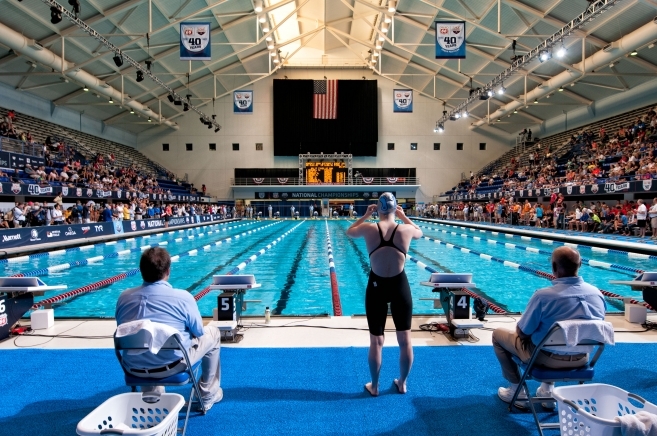 This past June, many of the nation’s top swimmers gathered in Indianapolis for the 2013 Phillips 66 National Championships and World Championship Trials. In addition to superstars such as Amanda Weir and Missy Franklin, our aquatic matting was also showcased prominently at this year’s event. PEM is no stranger to prestigious athletic competitions. Over the last 3 years, our slip resistant matting has been placed into action at several high profile events including: 2012 TEAMS Conference & Expo, 2012 London Marathon, 2011 USA Swimming Duel in the Pool, 2011 London Marathon and the 2011 Women’s NCAA National Division I Swimming & Diving Championships. As you can see, the vibrant blue color of our Aquatic Matting blends in with its surroundings. In fact, the NBC television commentators raved about the color saying the matting popped on the screen. Equally as important to note is the durability of our matting. The aquatic matting that was used for this specific application was also used last year at the U.S. Olympic Swim Trials in Omaha, Nebraska. Because our slip-resistant matting is easy to store and transport, the organizers were able to ship the matting from Omaha, saving them time and money.